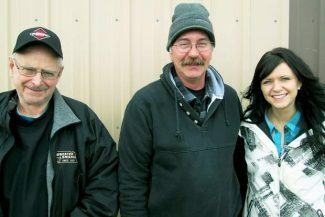 Harlan Rausch, Hoven, S.D.., with Steve and Mikayla Meidinger, Zeeland, N.D.
Jim Hauck of Triple U Ranch, Akaska, S.D., bought Lot 4282 at $15,500 and Lot 4075 at $12,500. Sandmeier Charolais, owned by Cal and Gary Sandmeier and their families, spread out the welcome mat for another good crowd that made for the best sale ever for this longstanding Charolais family. This sale is a good source for hybrid vigor which is evidenced by feed efficiency, genetic profit, tenderness, and genetic quality. Sandmeiers offer a large selection of big, stout, virgin two-year-old bulls, as well as an outstanding set of fall and yearling bulls. The Sandmeier bulls are responsible for a huge portion of the Charolais cross feeder cattle that are produced in the five state area. Sandmeiers use DNA technology. The bulls have been tested and their Molecular Value Predictions (MVP's) were included in the catalog for the traits of feed efficiency, marbling, and tenderness. But the Sandmeiers still believe that the best economic trait is simply the hybrid vigor that comes from using their Charolais bulls on English bred cows. The top selling bull of the day was Lot 4299, selling for $17,500 to Acadia Ranching, LTD, Acadia Valley, Alberta, Canada. Sired by Wells Stampede 1450, he was an April yearling bull with an 86 pound birth weight, a weaning weight of 876 pounds, and a yearling weight of 1,330 pounds. His EPDs were BW 0.6, WW 38, YW 70, and MILK 5. Lot 4185 sold for $16,500 to Wells Charolais Ranch, Conde, South Dakota This April yearling was sired by Wells Hard as a Rock 2596 and had a 90 pound birth weight. He weaned at 937 pounds and posted a yearling weight of 1,399 pounds. His rib eye was 17.4 sq. in., and he had EPDs of BW 0.6, WW40, YW 67, and MILK 4. At $15,500, Triple U Ranch, Akaska, South Dakota, was the final bidder on Lot 4282. Born at 84 pounds, he weaned at 929 pounds, and grew to a yearling at 1,308 pounds. His EPDs were BW -0.7, WW 40, and YW 64. Repeat buyer Mike Peterson, Cresbard, South Dakota, chose Lot 4061 at $15,000. With an 88 pound birth weight, he weaned at 934 pounds, and posted a yearling weight of 1,368 pounds. His EPDs were BW 1.5, WW 38, and YW 66. This bull was sired by SCR Sir Paycheck 0095. The interest stayed strong, and after some active bidding, Dennis Hulm, Meadow, South Dakota, had paid $13,500 to own Lot 3525. He was an August fall yearling with an 87 pound birth weight, a weaning weight of 828 pounds, and a yearling weight of 1,457 pounds. This August bull was sired by DCR Mr Buckle Assert, and had a 17.75 sq. in. rib eye. Terry and Brett Henderson, Lodgepole, South Dakota, liked the qualities of Lot 4168, and they paid $13,000 to own him. He had an 89 pound birth weight, had weaned at 892 pounds and posted a yearling weight of 1311 pounds. His rib eye was 18.1 sq. in., along with a 42 cm. scrotal measurement. Terry Henderson also bought Lot 4298, a son of EC/CY Rally 7033 PLD, at $12,500. 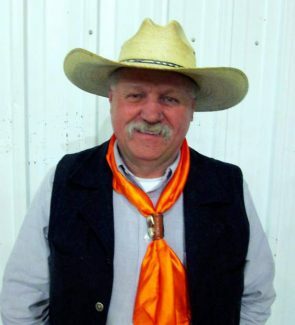 Lot 4027 sold for $13,000 to repeat buyer, Mike Peterson, Cresbard, South Dakota Mike comes back almost every year to buy some of these stout bulls. With an 87 pound birth weight, he weaned at 789 pounds and reached 1,251 pounds as a yearling. His EPDs were BW 1.1, WW 29, YW 52, and MILK 7. He was sired by SCR Sir McTender 1407P. Lot 4075 was another purchase by Triple U Ranch. Sired by WCR GunSlinger 2148P, he had EPDs of BW -2.1, WW 41, YW 71 and MILK 5. He scanned a 17.8 sq. in. rib eye. He had a 76 pound birth weight, a weaning weight of 851 pounds, a yearling weight of 1341 pounds, and a purchase price of $12,500. This was the best sale ever for these good friends of mine.